Red and purple chairs anchor the family room sitting area, near the back side of the fireplace. The family room is adjacent to the kitchen. Ceiling lighting adds to the appeal of this comfortable entertaining area. Interior designer Lynn Knight Jesse took an ordinary brick home in Midtown Tulsa and created a masterpiece. 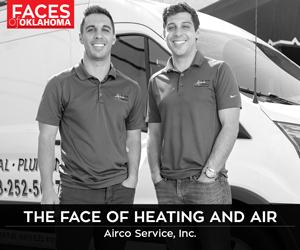 “The home had no amenities whatsoever,” Jesse says. She started with the bland exterior and progressed throughout the home by adding more square footage, revamping interior spaces, raising ceilings and building a deck easily accessible from the bedroom, family, kitchen and living areas. A colorful, geometric patterned rug and an unusual contemporary crystal chandelier accent this welcoming setting. The result is a haven of contentment, filled with color and a perfect setting for entertaining, according to owners Harvey and Cheri Tatum. The total renovation began with the front entrance, which Jesse vaulted. She added an eye-catching, bright-red front door for a welcoming visual impact. All the brick was covered with stucco. New windows and doors were added throughout the home. A new deck was designed to be visible from the bedroom, living and kitchen areas. A small lake accents the back of the home. A swimming pool enhances the beautifully landscaped garden. 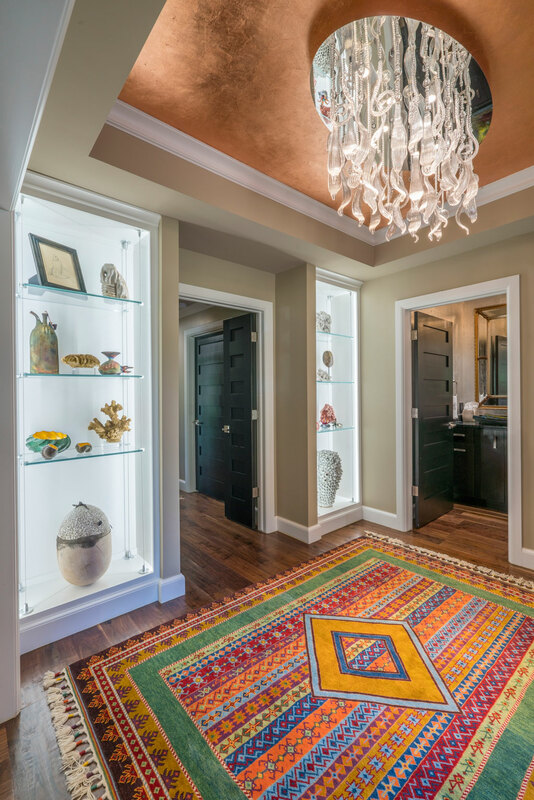 The entry foyer is a large, vividly colored conversation piece. Of particular interest are two bookcases suspended by cables that make a strong visual statement as guests enter. The shelves are filled with a collection of fossils and sea treasures, reflecting Cheri’s professional career as a marine biologist. Two bedrooms also received extensive face-lifts and a mood change. One is an elegant his-and-hers master closet. The other is a home office for Tatum, head of the gastroentology department at Hillcrest Medical Center. 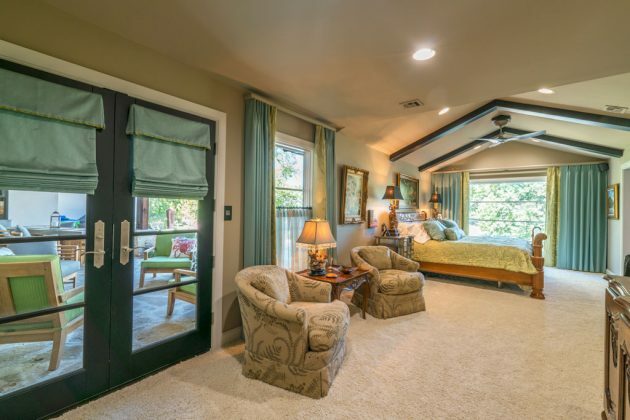 The master bedroom overlooks the deck, lawn and pool because “Dr. Tatum wanted [it] to look dramatic,” Jesse says. The setting makes a moonlight swim enticing. 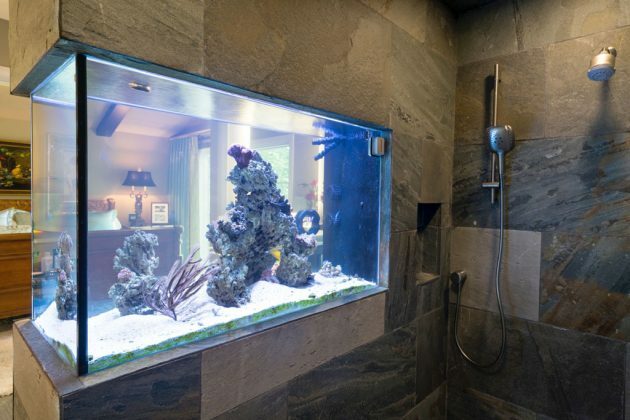 Most unusual is the large, saltwater aquarium inside the shower in the adjacent master bath. The effect is soothing. 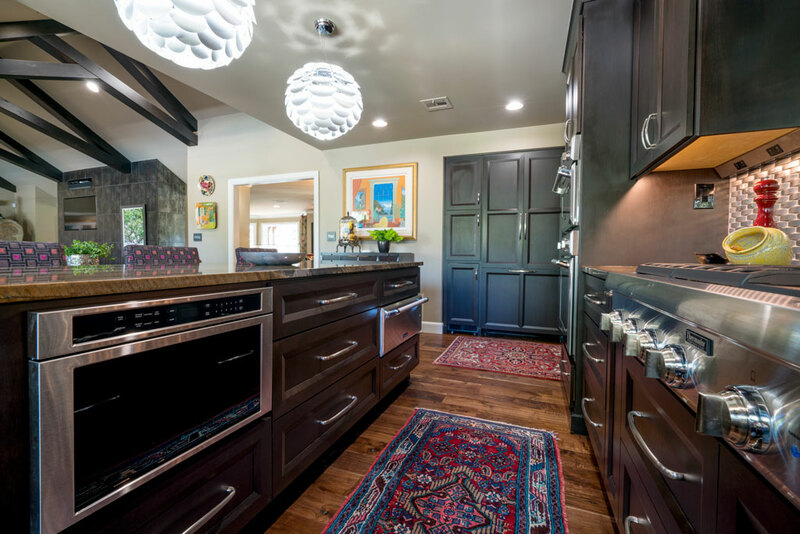 The kitchen’s center island is highlighted with two large globe lights, illuminating the island. All of the walnut cabinets feature a mink finish. Most unusual in the master bathroom is the 400-gallon saltwater aquarium housed inside the master shower. the aquarium is visible from the master bedroom. The His-and-Hers master closet is enviable. The large storage center island is accented with another unusual crystal chandelier with a contemporary look. 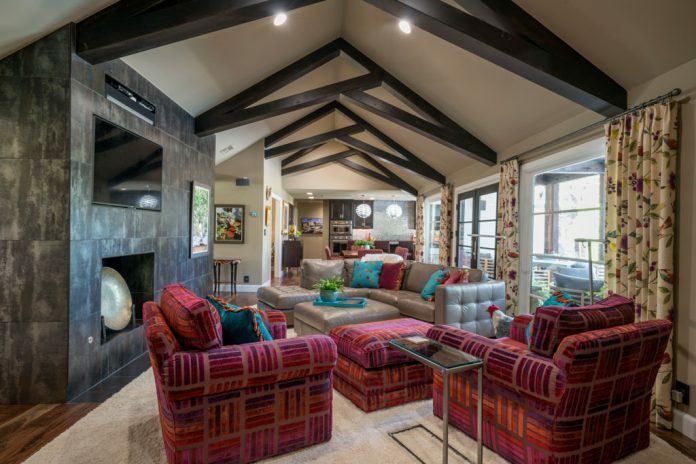 Bold colors pop in this living room. Red IS a major color theme for the home, with designer Lynn Knight Jesse adding touches of lime and turquoise. A granite named "Scandalous" covers the center island and countertops. The backsplash all around the cabinet and sink are of stainless steel. In this kitchen, the recessed refrigerator looks more like a stunning wall cabinet than it does a fridge. 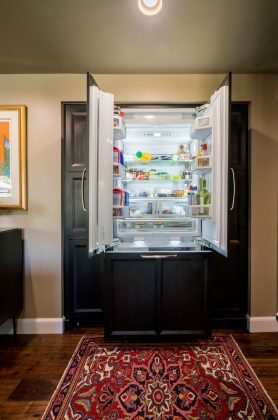 By covering the refrigerator to resemble a wood cabinet, the kitchen has more space and a more open feeling. 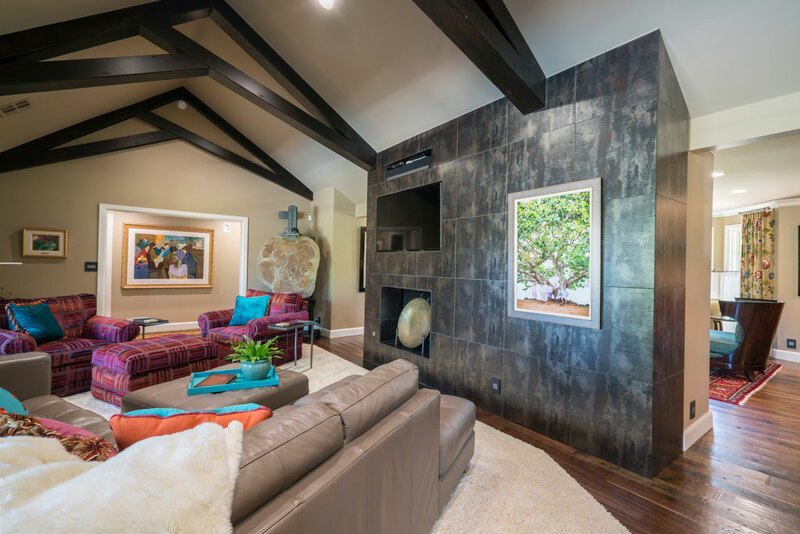 The fireplace wall separating the living room from the family area is covered with metallic copper and bronze tiles for a striking new look. 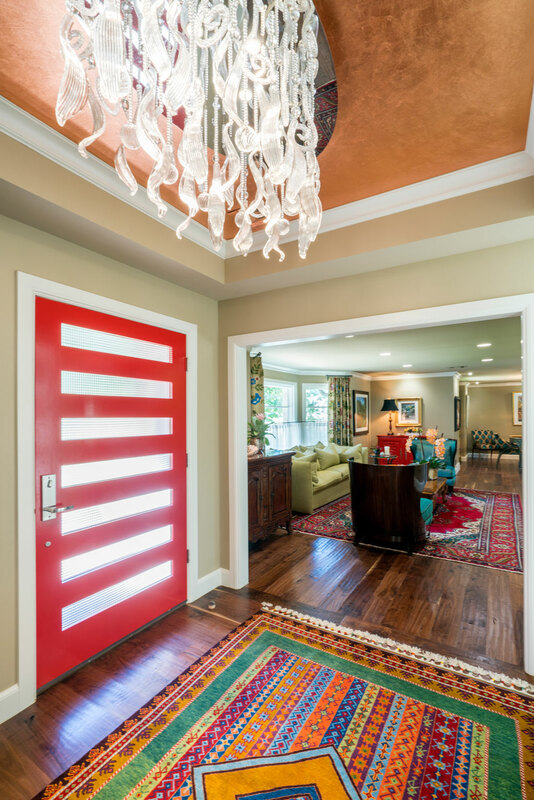 The back of the front door in the entry hall is a real conversation piece with its red stripes and opaque windows. Elegance is the hallmark of the master bedroom with a quiet color scheme. While the decor suggests a serene environment, the windows and doors leading to the back lawn bring the drama of nature inside. 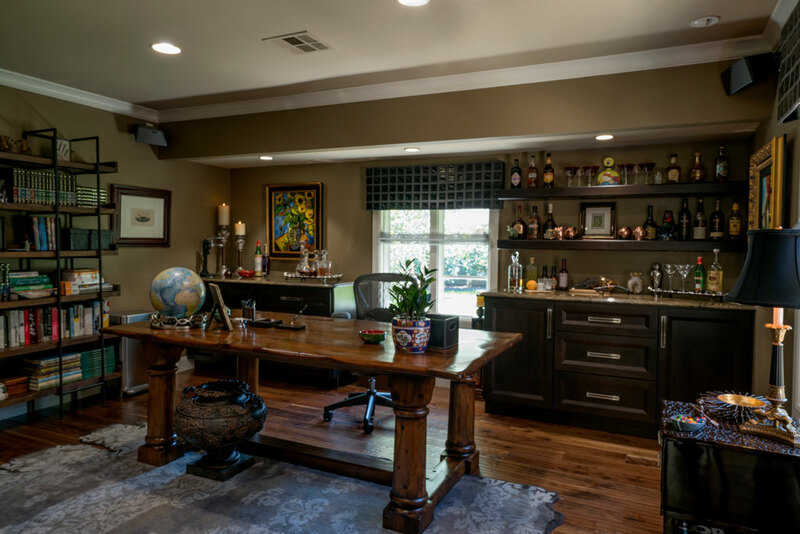 In the process of converting a bedroom to Dr. Tatum's home office, an old dining table was repurposed for his office desk. Art abounds in this setting. Lighting was another feature that required extensive updating. Exquisite chandeliers in a variety of modern styles hang in all the major rooms. Contemporary art is a recurring, colorful theme throughout the home. Another significant change occurred between the living and family rooms. A fireplace wall had originally separated the two distinct spaces. To give those rooms a more open feeling, the walls on both sides of the fireplace were opened up. The fireplace was also enhanced on both sides with copper tile. 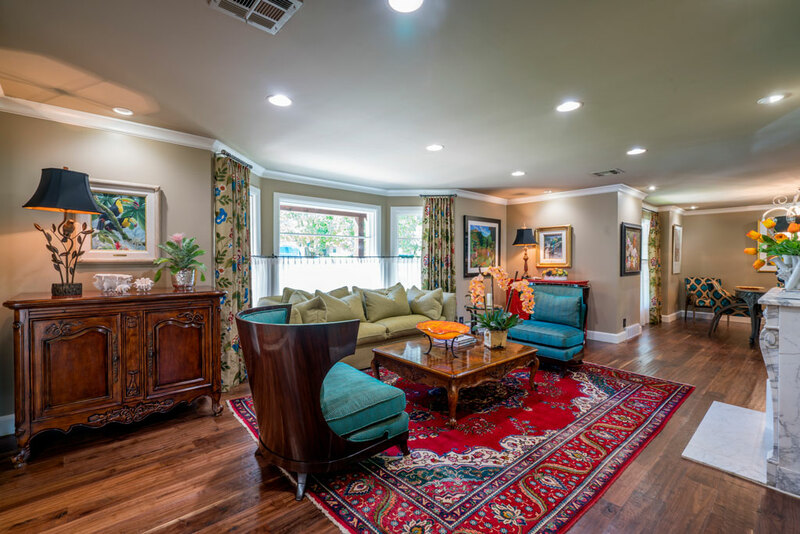 The space between those rooms appears seamless and makes entertaining much easier. 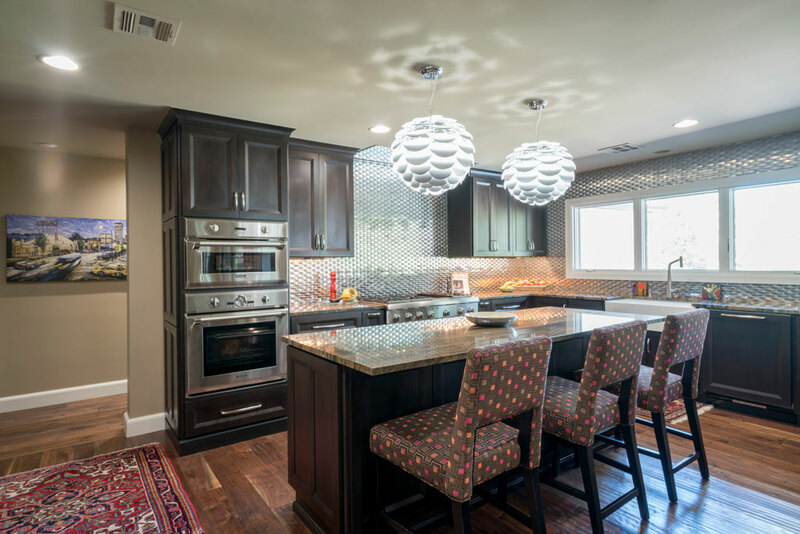 Jesse is noted for her Kitchen Concepts design firm and says the kitchen is actually small and initially looked like it was part of the family room. By concealing the refrigerator, adding windows to bring a poolside view to the kitchen and maximizing minimal space, the kitchen acquired the look of a spacious setting for casual dining. With its grand exterior views and an intriguing character, this home is a welcoming place for the Tatums to entertain friends and family.